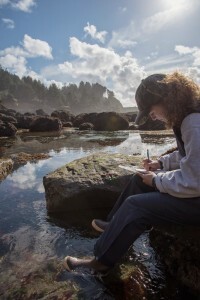 Sally Hacker is a community ecologist and professor in the Department of Integrative Biology at Oregon State University. Among other research and teaching responsibilities, Dr. Hacker developed and co-instructs a 15-credit marine biology WIC course (BI 450 Marine Biology), which is offered every spring at the Hatfield Marine Science Center in Newport, Oregon. Admission to BI 450 Marine Biology is competitive; students who are accepted into the course live in Newport for the term and take only this one class. In the following excerpts from a longer interview with WIC program intern Natalie Salah, Dr. Hacker discusses her background as a community ecologist, the structure of BI 450, and the kinds of writing students do in this course. Natalie Saleh: Can you give a brief explanation of what you do as a community ecologist? 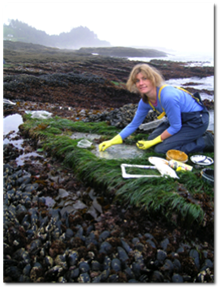 Sally Hacker: As a marine community ecologist, I look at how species interact with one another in natural systems on the coast. My current research focuses on the role of species interactions and coastal oceanography in structuring coastal ecosystems including rocky shores, estuaries, and sand dunes. In other words, I study how the physical forces from the ocean influence the ecology on the shoreline. NS: What inspired you to study community ecology? SH: I was inspired when I was an undergraduate at the University of Washington. I was really interested in marine biology and ended up going out to Friday Harbor Marine Labs up in the San Juan Islands. I really liked studying animals and working in coastal habitats and being outside. I fell in love with community ecology and ended up going on to graduate school and choosing it as my life’s work. NS: How long have you been at Oregon State? SH: I have been here for 11 years. Before coming to OSU, I was a faculty member at Washington State University in Vancouver, Washington. NS: Can you tell me about the WIC course you teach? Spring 2015 BI 450 students at the top of Cascade Head near Lincoln City, Oregon. SH: Marine Biology (BI 450) is a WIC class where students spend the term at the Hatfield Marine Science Center in Newport. The class is divided into six one- to two-week sections, which focus on different topics and are taught by different faculty. The topics covered in the course are marine invertebrates, marine fishes, marine algae, community ecology, marine conservation, and a final research project of the students’ choosing. I teach the first two weeks, which focuses on marine invertebrates, and the last two weeks, which focuses on the final project. In the last two weeks, the students take all the knowledge they have gained during the prior eight weeks to design their own research project. The projects involve some kind of research outside in the field or inside the laboratory. The students collect data, and then they write a scientific paper based on that data. Then they present their projects to the class, and we invite everyone from Hatfield to come for their presentations. NS: What does the average day look like for students in BI 450? SH: Oh, it’s really long. It depends, but we are often in the field by 6 a.m, if that is when the low tides are. Fieldwork might include walking around, identifying species, collecting some of them to bring back to the lab, taking notes. We might spend two or three hours out there. The rest of the day usually includes a couple of lectures and a few hours of lab work. Sometimes at night, there are special lectures. We will have somebody come in and talk about their work or their research or about what it’s like to be in graduate school. During the first week, we schedule a lot of evening activities so that people can get to know each other. The course instructors are always beat by the end of our two weeks of teaching. We’re basically working all day long, and there’s no time to do anything other than be part of that teaching experience. But after our two weeks, the students are still there. They love it, but it’s pretty intense. 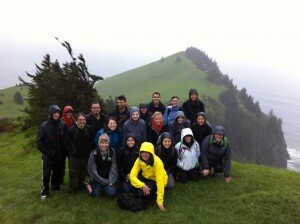 They’re really devoting ten weeks of their life to that class, away from Corvallis, not being around their friends. But most people who do it say it’s the best class they ever took at OSU. NS: What kinds of writing do students do in BI 450? SH: They do all kinds of writing, but the major formal assignment is a scientific paper about their final project. To do that, we teach them how to write different parts of the paper in each section of the course, so by the time they actually write their papers they know what they are doing. We also have them write an op-ed in the conservation section of the course, about a topic they are interested in. They have to take a side and write an opinion about the topic. This is a really different writing style than scientific writing, so it gets them out of their comfort zone. We have a blog for this course, and students are responsible every week for writing a blog post in which they reflect on what happened that week. It is informal writing; the only requirement is that they write about their experiences in the course, try to spell things correctly, and make sure it is PG-13!The blog is really fun for the professors too, because you can find out what the students are up to in the sections you aren’t teaching. The course involves a lot of memorization of species names. To help with this, one instructor has the students make ID cards. She gives them a certain group of marine algae that they have to work with, and then they have to teach the other students about that group of algae, using the ID cards. The students always have notebooks out in the field to record their observations. Just taking notes is a skill, especially when it’s pouring down rain. 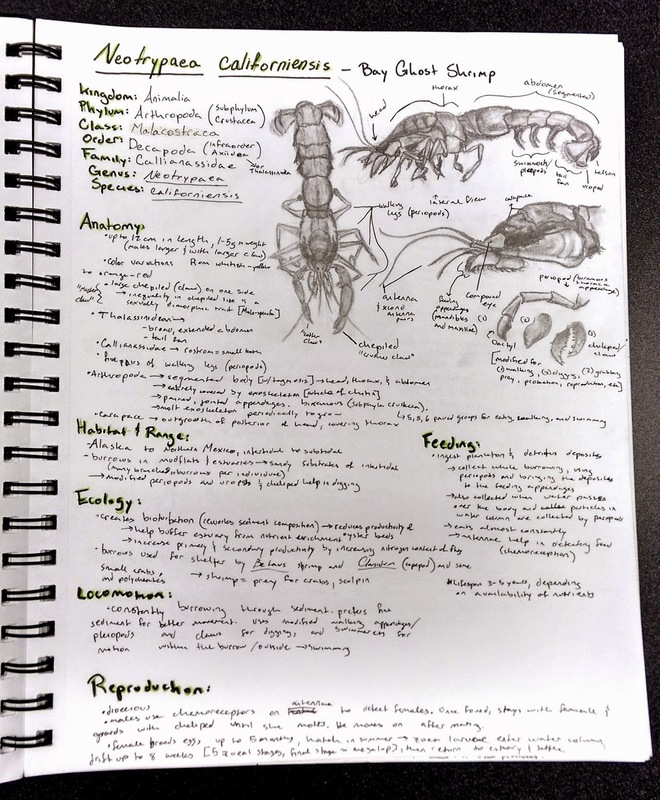 Taking the time to observe something about a given species and write their observations down on paper can help quite a bit in learning about the species. NS: Going back to the formal writing assignment, can you give some examples of final projects students have done? 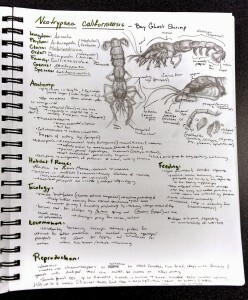 BI 450 students also keep journals where they draw and write about species they encounter during their fieldwork. SH: They do all kinds of projects. The Hatfield visitors’ center has a resident octopus living in one of the tanks. It is really popular. Students have done projects looking at how octopuses find and determine whether something is prey. For example, one project involved trying to trick an octopus with a plastic crab versus a real crab to see if the octopus can detect which is which. The octopus of course picks the real crab, because octopuses are really smart. Other students have investigated limpet feeding or fish foraging behavior in the intertidal zone. Also there are a lot of projects looking at crabs—where they live, their habitat preferences, and how they avoid being eaten. And there have been projects about the behavior of mother and baby seals. Students will look at harbor seals and examine how often the baby seals feed. Some students have looked at whether seals are scared by boats or are disturbed by people. NS: What advantages do you see about writing the scientific paper in such a condensed time frame? SH: I think it gives students a sense of accomplishment to be able to complete a research project from start to finish in two weeks. It’s a culminating project, pulling from all they have learned over the prior eight weeks of the course about how to do research, write a research paper, and give a talk. My experience is that they are excited to finally sit down and write their own paper on the discoveries they have made. All the preparation they have had for that moment unleashes a sense of independence and accomplishment that is great to see as a professor. NS: In what ways do students help each other on the final project? SH: They can work in groups of up to three (some do work alone though) and they help each other with all aspects of the project from writing the proposal to collecting data to analyzing their data to reading each other’s work. But they are all responsible for their own papers in the end. NS: How do you think the genres that aren’t typical in science fields, like the blogs, help students learn the course concepts? SH: I think it helps them a lot, because they are not pressured by getting the writing right. They are just thinking about communicating something to somebody else. NS: What do you think is the main advantage of taking the 15-credit marine biology course as opposed to more traditional classes at OSU? SH: What people have told me is that they benefit from being immersed in marine biology all the time. The students don’t have anything else to think about but this class. The class is also split up into sections, and once a section is done, it’s done. I think students quickly realize that that’s a really good way to learn, because they are not thinking about multiple topics and trying to get many different projects done at the same time. They also meet so many people at the marine lab. There are many people who work for the state and the federal agencies, so students get to meet people who can help them potentially get a job, further their career, or help with their research. It really benefits the students once they leave OSU. Posted in Interviews, Winter 2016.